Developing the right systems correctly – Requirements Engineering sets the course for this. All project stakeholders have to be recognized as well as their interests and goals, which might contradict each other. The system scope and environment must be clear. This is why requirements engineering with objectiF RM starts with stakeholder analysis and system demarcation. All results are documented consistently and are subject to version control. Relationships between stakeholders, their goals and the requirements derived from them are always traceable. Who is interested in the system under development, who does it concern, who is participating in its development both directly and indirectly? Why? What goals are stakeholders pursuing? Are there, for example, goal conflicts that have to be resolved? How large an influence does each stakeholder have? These are questions for stakeholder analysis. Evaluation of stakeholders and their goals. Stakeholders change, goals change. That is why stakeholder analysis artifacts are subject to version control in objectiF RM. All changes can be traced thanks to the automatically generated history. Configurable queries in objectiF RM’s repository provide real-time information in a list. Would you like to have this information in Excel? 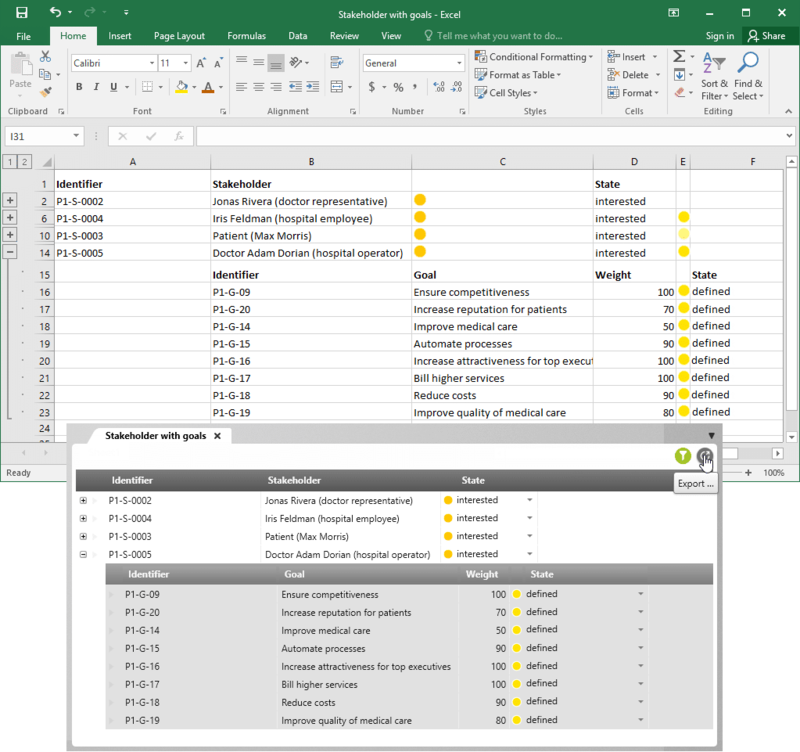 No worries with objectiF RM’s Excel export feature. Which goals and requirements refer to which stakeholders? The stakeholder form has the answer. 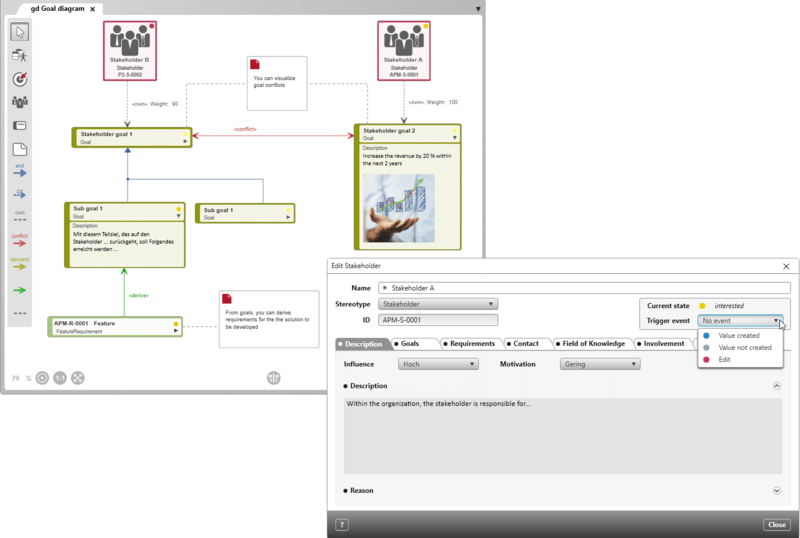 Once you have presented a relationship between a stakeholder and their goals and requirements – in a diagram or a form – they will be saved in the real time repository of objectiF RM, redundancy-free. Many projects suffer from sneaky scope creep. It causes project costs to increase and endangers deadlines. The safest way to work against this is by clearly demarcating the system and its environment early on, creating reference framework for the project team’s work and a foundation for stakeholder communication. 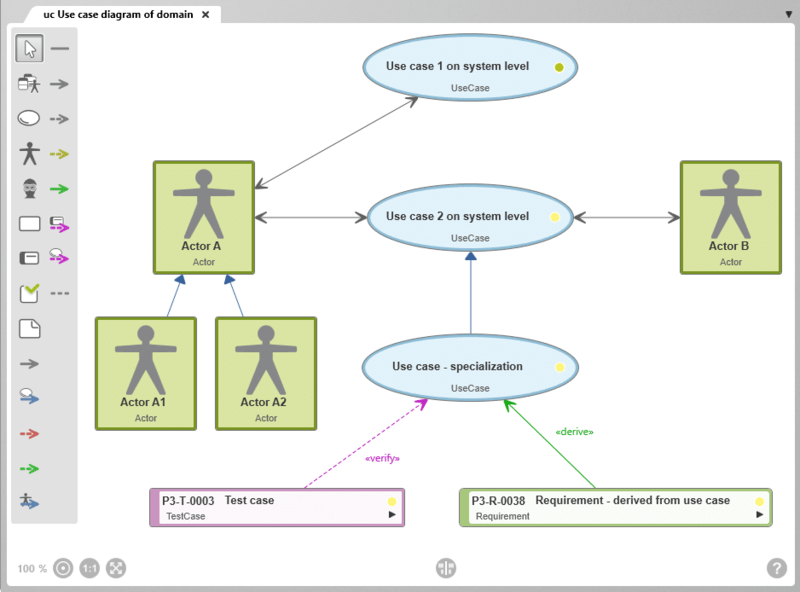 Special system context diagrams that are methodically based on data flow plans. The advantage: Aside from the limitation of the system, they can also be used to record restrictions on the system in the form of norms, standards, legal regulations, etc, that the system is subject to. Classic use case diagrams, which demarcate the system by modelling interactions with users and neighboring systems. Who interacts with the planned system, who exchanges what information and does that belong to the system context? Which restrictions is the planned system subject to? These questions can be answered with the system context diagram. Its strengths: It can be designed with images and icons, so it is recommended for stakeholder communication. 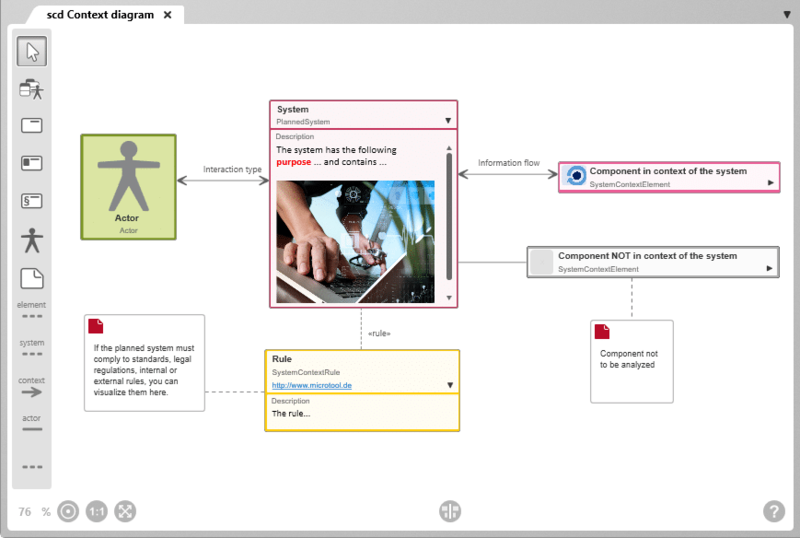 For projects where stakeholders are familiar with formal communication mediums, objectiF RM offers the use case diagram for system demarcation. Advantage: central acceptance criteria from stakeholders and the first system requirements can be recorded at a very high level.